SELAMAT HARI RAYA to all Malaysians and a Happy Eid Mubarak for the rest of the world. Another year of completion of the month of fasting. I'm on the right in my usual stiff pose. Behind us is Granduncle's kampung (village) house. 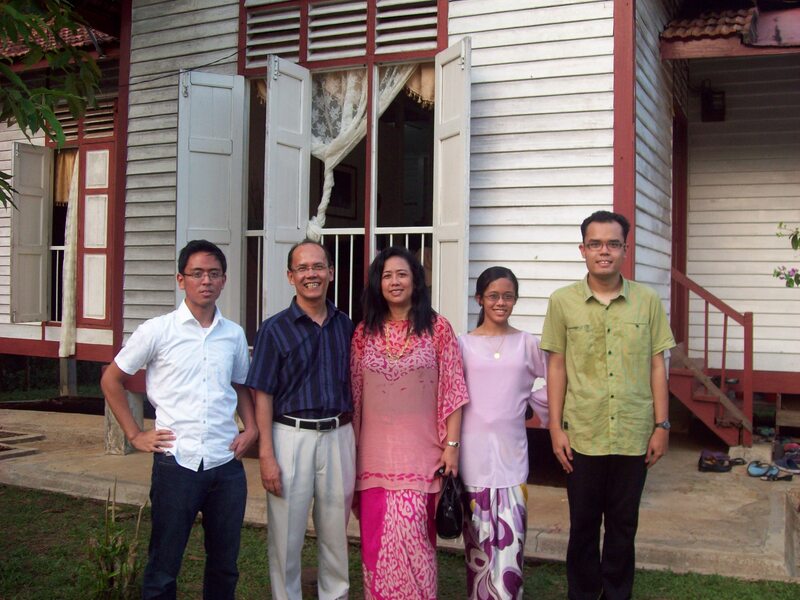 Last week we went back to Linggi, our kampung (village, hometown) to celebrate Hari Raya with our huge extended family. How huge? Picture a football-sized field (almost) with dozens of parked cars and a sizeable canopy enough to shield close to a hundred people from the sun while they enjoyed a hearty feast. I do not know half of the family and I don’t remember the names of the half that I do know. Festivals like these are more often for me just blurred memories filled with laughter (of other people), lots of food and relatives dressed in their best. The part I like best about going back to the kampung is the chance to pet and feed the baby goats that belong to grand-uncle. It used to be a terrible, tormented time for me because I would keep my hands pressed on my ears to keep out the painful noise and when it got too much I would just sit and cry for hours. Mum refused to stay away or keep me secluded in a quiet room. She kept whispering “it’s alright, we will overcome” as she rocked me back and forth. And I did overcome. By the time I was 5 years old I was able to join in the festivities without freaking out. The next thing I had to learn was to fight the temptation of the sweet stuff. It was everywhere I looked, unlike at home where there wasn’t a trace of sugar due to my strict no-sugar diet. You can’t imagine what it’s like to see the spread of mouth-watering desserts and not being allowed to eat it. Of course, the ugly tantrums made its appearance. Relatives told Mum to relax, let the poor kid have some…after all it’s Hari Raya. Mum did not budge. The only exception she made was to allow me the colorful non-aerated drinks…….diluted so much that it tasted like plain water but I was none the wiser. 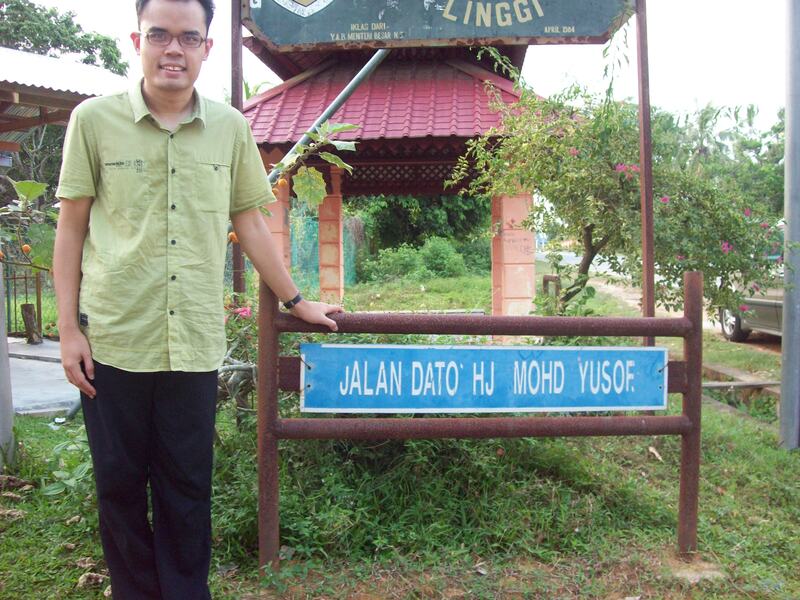 This road is named after my great-grandfather, Dato' Hj Mohd Yusof. A school behind me is also named after him. On the way home, Dad stopped by a road sign and told me that the school and road was named after my great-grandfather, Haji Mohd Yusof. Wow, I think its cool to have a school AND road named after you don’t you think? Never mind if it’s just a small road in the village. It means my great-grandfather must have played an important role in the community and this is the way he is honored and remembered by the said community. He was known to be a serious, highly respected man whose occupation was then known as ‘visiting school inspector’. Mum said I may never have a road named after me but hey, I have a blog in my name. That’s pretty cool too.